We are pleased to inform you that our featured book Syrian Law is currently in the process of being published. We advise you to read through the summary below in order to get better acquainted with the content of the book and the numerous legal subjects that are explored in detail. 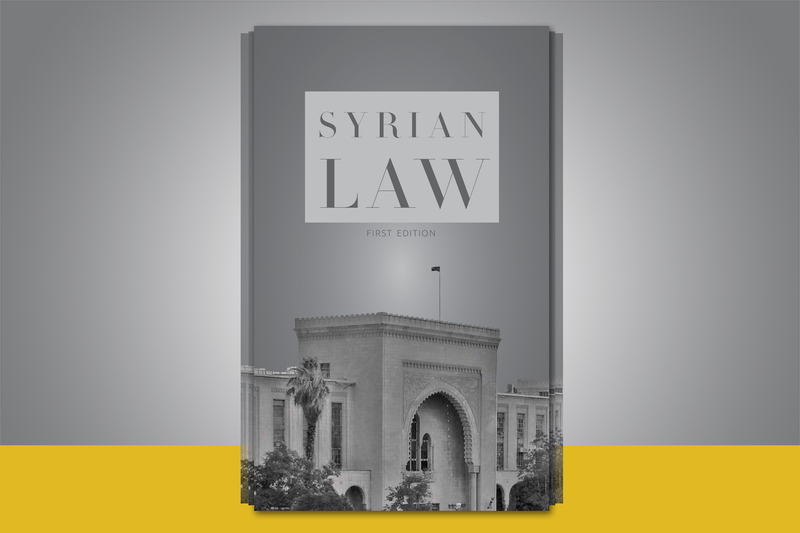 As this is the first edition of Syrian Law, the author will be producing subsequent editions in order to keep readers continuously informed of ongoing developments in the law. In order for us to notify you when Syrian Law will be available for purchase, please click here. SUMMARY While an abundance of legal literature on Syrian law in Arabic is easily accessible to interested readers, it has proven rather strenuous to come across a single comprehensive source in the English language. In this respect, Syrian Law is the first book of its kind that seeks to introduce the Syrian legal system to a wide variety of English speakers. The world has become accustomed to associating Syria with the brutal effects of conflict and humanitarian disasters that have devastated all Syrians. This single impression alone does no service to such a country that has a rich heritage and history behind it and a proud people that has been at the forefront of human civilization. Throughout the 20th century, Syrians established a secular, civil legal system based on the models of continental Europe and enacted legislation in a range of sectors to reflect international standards. For any individual interested in Syria, these are crucial facts to familiarize themselves with and this book seeks to convey that message as well as offer the proper context to understand the legal developments that have taken place. To reflect these achievements, Syrian Law pores over an exhaustive list of legal subjects and delves into significant detail on Constitutional Law, the Court System, the Civil Code, Commerce, Company Law, Investment Laws, Property Law, Intellectual Property Law, Media Law, Finance, Insurance Law, Employment Law, Public Procurement, Taxation Law, Environmental Law, Civil Society Law, Family Law, Nationality Law and Criminal Law. Not only are the relevant laws discussed in considerable detail but the historic and economic contexts to the underlying legislation are also included to give readers a grasp of the various policy objectives being pursued at the time of enactment. At the center of the Syrian legal system is the Constitution of 2012. While the current Constitution is highlighted, its predecessors are also examined to portray the different political directions that governments have followed when coming to power. As part of the judicial branch, the court system is detailed separately with a discussion on the civil and criminal courts and the main administrative court, the Council of State. Sections dealing with arbitration and the legal profession are also featured. As the basis of any civil law jurisdiction, the Civil and Commercial Codes are of primary importance. As testament to this fact, all the contents of the Civil Code are listed and additionally, there is a distinct focus on contract law. As for the Commercial Code, a discussion on economic policies and international trade is intended to provide readers with substantial insight into Syrian commerce before exploring the Code itself and continuing on to Company Law. Investment legislation is also meticulously presented with particular reference to the general Investment Law and specific laws tailored to the touristic, agricultural, energy and education sectors. Moreover, consideration is given to special designated zones such as free zones and industrial cities. As a fundamental facet of any legal system, numerous aspects of Property Law and the history of land reform are described in detail. As another form of property protection, intellectual property rights pertaining to patents, trademarks and copyright are scrutinized since more recent legislation has come into effect. After a discussion on copyright legislation, a separate chapter considers essential references to the new Media Law. The roles of financial policy and institutions over the course of the last 60 years are touched on before introducing the legislative changes that permitted the return of the private sector to the financial industry in the 2000s. A separate chapter on Insurance Law similarly focuses on policy changes in this sector during the same decade. The chapter on Employment Law also considers the additional topics of employment in the agricultural and public sectors. An in-depth discourse shines light on the current Public Procurement Law and the Draft Public-Private Partnership Law that could see light in the near future. In addition, the recently updated Income Tax Law along with the numerous amendments affecting property taxes, custom duties, import tariffs, consumption taxes, inheritance taxes and stamp duties are assessed. Syrian Law concludes with five further subjects to satisfy the interests of readers including those relating to the environment, civil societies, families, Syrian nationality and criminal acts.